Fig. 14.26 . 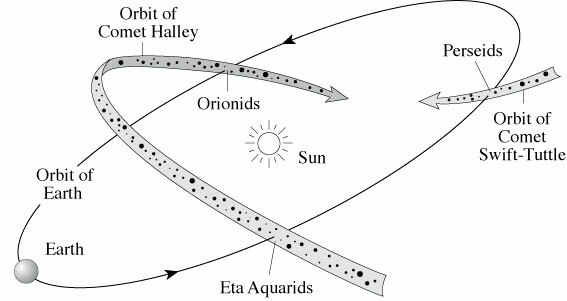 The Earth’s orbit intersects a stream of meteoric material left along the orbit of comet Halley, producing two meteor showers, the Eta Aquarids in May and the Orionids in October. Other comets intersect the Earth’s orbit just once during their trip around the Sun. Annual meteor showers are created when the Earth enters the intersection point, such as the August Perseids produced by debris from comet Swift Tuttle. The orbit of comet Halley is inclined by 162 degrees with respect to the ecliptic, the plane of the Earth’s orbit, while the orbit of comet Swift Tuttle has an inclination of 114 degrees.